Digital game, in cd key format of Alien: Isolation The Trigger DLC, the fifth expansion pack for Alien Isolation. 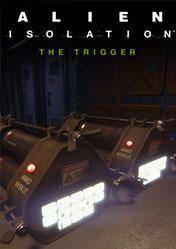 The digital key that you will receive after purchasing Alien: Isolation - The Trigger DLC must add in your Steam account to proceed with the download of this DLC. On The Trigger, which adds more content for Alien: Isolation, we will have three new maps Survivor mode, where we fight for our survival and try to get the highest score possible. We must avoid security alarms and place explosives throughout the ship. Remember that if you have Alien Isolation Season Pass, you'll have access to this DLC. Also remember that all the shops listed in the following comparison of prices for Alien: Isolation The Trigger DLC cd key, have been tested and verified by our team, so they are totally reliable.